Alexandre: I recently got interested in the works of the Japanese architect Sou Fujimoto. What he achieved for the serpentine gallery pavillon in 2013 is absolutely stunning. Massimo: The Red Book by CG Jung, any painting by Pablo Amaringo, and Tabula Rasa by Arvo Part. 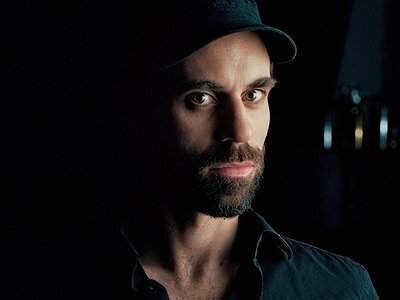 Alexandre Babel: I started beating metal biscuits boxes with crayons at the age of 2, with the very clear idea of trying to create music out of it. My first hero was Ringo Starr… Then later I couldn’t stop listening to Elvin Jones and Tony Williams. Not only because of the groove, but also because of the revolutionary thinking of sound of both these drummers. Sound soon became my main concern. Massimo Pupillo: I think it’s impossible to translate into words what draws me to sound and its construction into music. It’s a deep resonance, that's all I can say. I started playing bass at 14 or 15, early passions were bass players like Peter Hook, Jah Wobble, Simon Gallup. In general I’d say bass guitar in post-punk music. Alexandre Babel: I neither consider my playing being «new » nor «original». I keep learning and copying from different sources. My actual main influence in terms of aesthetics is what I learn from the other people I work with. I do a lot of different things, playing different kinds of music, in different scenes. So what I learn on one side of what I do influences another side of what I do … My own language is the meeting point of all these practices. Massimo Pupillo: I never tried to be able to emulate anyone in particular, I always felt that if I had something to offer that would be channeled in my own unique way. For years I listened to so much music and so many influences coming from every corner, not only music but also literature, (a lot), art, theatre, films, and then opening up to mythology and other areas that in general are not so associated with music. It was years of distilling influences and letting them organically coagulate, as in a slow alchemical process. Massimo Pupillo: The main artistic challenge, I guess, lies in the questions: What is this? Is it something I really need to say? Or is it what is most comortable and known? Do I have the courage to step out of what I did before and what is expected from me and just say what feels relevant to me in this very moment? Do I have the courage to disappoint? Alexandre Babel: The physical aspect of the drums and percussion is the most important one. The acoustic vibrations going through the instrument’s bodies and the many possible ways of producing these vibrations (hands, mallets, sticks, etc.) is the most interesting thing to me. Massimo Pupillo: Bass guitar is such an underrated instrument, mostly used as accompanying the main instruments. So when you decide to not have a guitar or piano and let it sound in the forefront, all kinds of possibilities open up. It has such a vast range of tones and sounds that I tend to look at it as if it’s a synthetizer, and I keep finding new ways to use it. Massimo Pupillo: I can only reply to this that I find myself particularly transformable. Alexandre Babel: There are many ways of approaching the work in a recording studio. In the case of a «live recording in a studio», even though «instant composing» is similar as the concert situation, there is a difference: You don’t play for the moment. You perform for the moment « after». You imagine your music being played and played again on CD, vinyl, etc. This affects a lot the performance I suppose. I am then more focused on details, less in the general energy and power. Massimo Pupillo: They are totally different experiences and they trigger different areas of one’s mind. I see playing for an audience as if the audience is part of the circuit made of bass guitar, pedals, amp, room. Every single part of this circuit is equally important. A live show is a communal experience, it’s a sort of ritual in a world that forgot what a ritual is. Massimo Pupillo: I’m the most far from a fixed schedule or routine you can imagine. Having said that, all aspects of life blends into each other. I take long periods off music every year and when I go back to it I feel that all those experiences turn into music and deeply feed it. I really do not believe anymore in quantity and in the western myth of productivity. Could you take me through the process of improvisation on the basis of one of your performances that's particularly dear to you, please? Where did the ideas come from, how were they transformed in your mind, what did you start with and how do you refine these beginnings into the finished work of art? Alexandre Babel: Most of the material performed in an improvisation is sound material that I used to practice. The moment of improvisation is like opening the drawers to pick up the right sound at the right moment. It is about organization of known material. And of course, the «moment of improvising» provides the energy, the accidents, the organic part which turns this whole organization into music. Massimo Pupillo: I see improvisation as an alchemical cauldron where you are a chemical substance that merges with others and transforms into something completely different. As in every other aspect of life, sometimes it works and sometimes it really doesn’t, and simply, there’s no manual or rulebook that one can apply to it.